YES, men can develop those knotty, twisted bulging veins called varicose veins just like women. Most of us think varicose veins are a female problem, not true. You may be surprised to learn, 45 % of all men experience varicose veins at some point in their lifetime. Varicose veins can affect men of all ages. Varicose veins are a medical problem and will progress without some kind of treatment. Because of the PAIN one experiences with varicose veins, it’s important to get treatment, to hopefully maintain an active, enjoyable lifestyle. Without treatment some men can develop serious complications even in the skin formation of open sores on the ankle, known as venous ulcers. It’s almost impossible to know, which veins will progress and which ones will not. It’s important to see a vascular specialists and let them determine and exam your legs before your legs / veins become problematic. Endovenous Laser Treatment – EVLT - This procedure involves inserting a small laser fiber through the skin into the damaged vein. This “laser energy” seals the veins shut to collapse so they can be reabsorbed and re-routed to other healthy veins by the body. Venefit – This procedure works in a similar fashion to EVLT, but uses radiofrequency energy instead of laser light to address the affected vein. Sclerotherapy – Injections of a special solution are placed inside the vein, irritating vein walls so the vessel seals closed. Microphlebectomy – This procedure removes varicose veins from the leg using tiny incisions and a small instrument that grasps portions of the vein and removes them. All of these treatments, involve very little discomfort or downtime, meaning most men can resume their normal activities and are able to return to work, immediately following treatment. 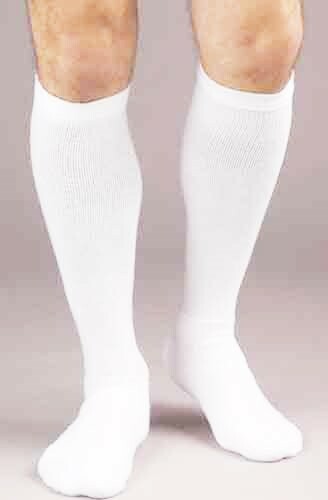 Some doctors may suggest conservative treatment even after a successful procedure, which involves wearing Compression Socks / Stockings as a preventive source for future venous problems. It’s most important if you have a family history / hereditary and if your lifestyle consist of standing or sitting a lot on a daily base’s. 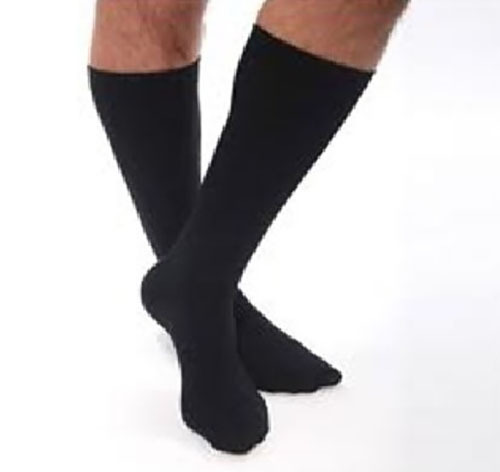 Rescuelegs.com provides a large fashion assortment of compression support socks, you would never know they are medical support socks, by looking at them. Check out our most popular customer favorites. If you’re a man and you have these symptoms, you’re not Alone! Be smart and take care of your legs, your legs and feet will thank you.